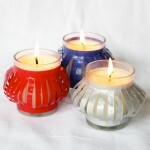 Add several drops of red candle dye to several cups of soy wax candle flakes in a pouring pot. Melt the wax using this technique. 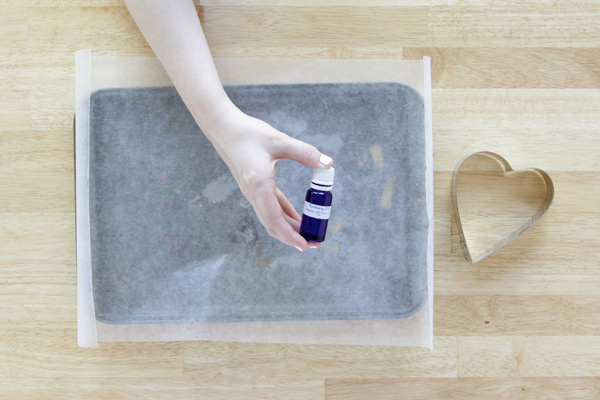 As your wax melts, lay a sheet of waxed paper somewhat larger than your baking sheet on it. When the wax has melted, add a few drops of fragrance. Take the wax off the stove and let cool for a few minutes, but not long enough that it hardens. 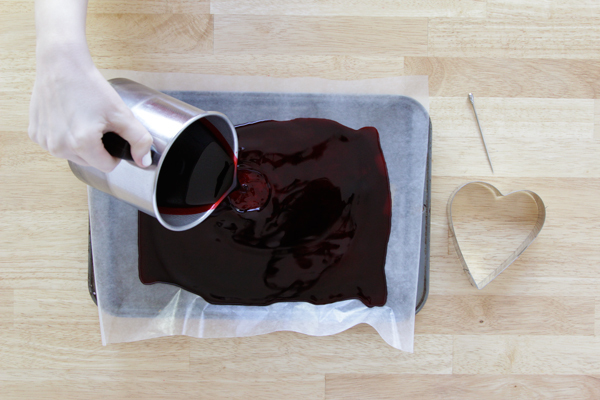 Pour your wax onto your baking sheet, as shown. It can be however thick you’d like, but I had the most success when the wax was about 1 cm deep. Let your wax cool until it changes color, but is still warm. 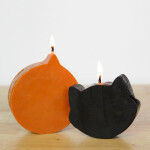 It shouldn’t jiggle like gelatin, but if it’s too hard, you won’t be able to cleanly cut out your candles. 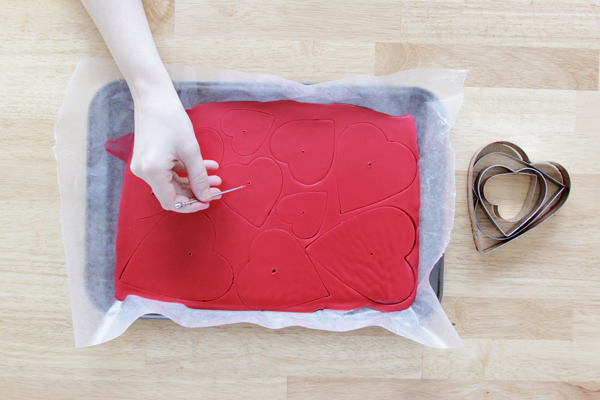 Stamp hearts through your wax with cookie cutters, leaving them on the sheet. 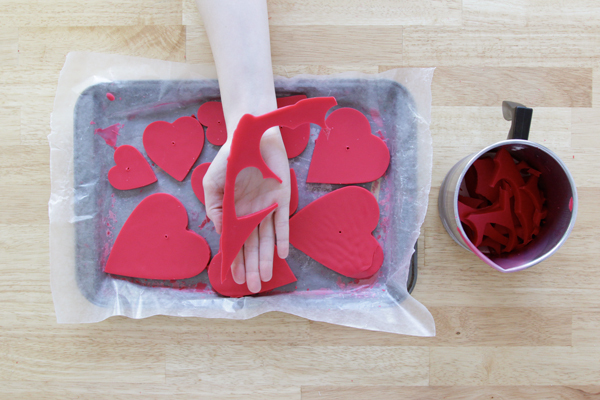 After you’ve stamped your hearts, use a skewer to poke a hole in approximately the middle of each heart. No need to be exact! 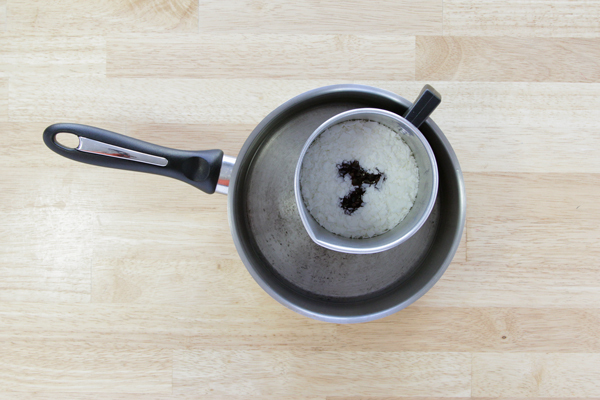 Let your wax cool for several hours until it’s completely hard (if you’re impatient, the fridge is a helpful tool). Carefully break your hearts away from the hardened wax sheet. 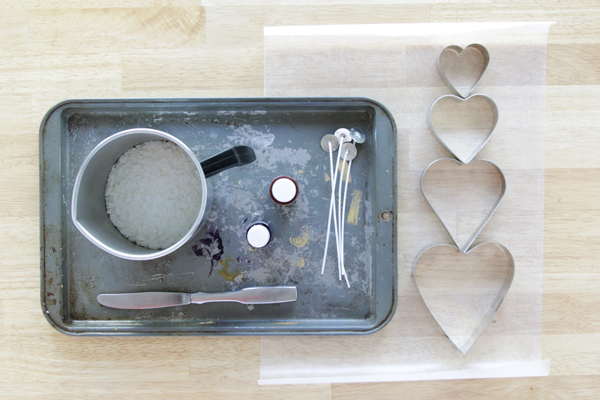 Put the remnants of the wax back in your melting pot, and add a few scoops of plain soy wax flakes to the pot. Repeat the wax melting, pouring & stamping process several times. 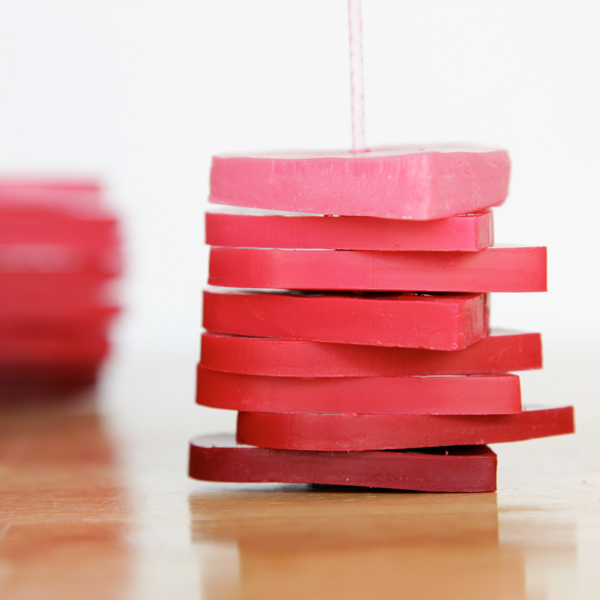 Since you’re adding plain white wax to the remnants of your wax, it gets a shade or two lighter each time you melt it, making an ombre effect! So easy! 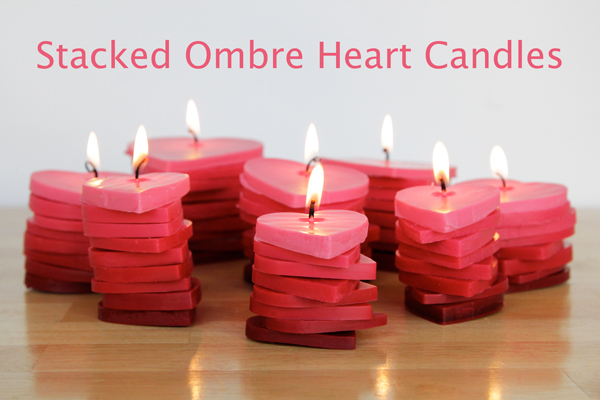 String your hearts onto a wick using the holes you poked in each one. Trim your wicks and you’re ready to go. 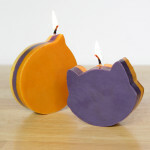 The uneven layers and non-precise centering make each candle unique. 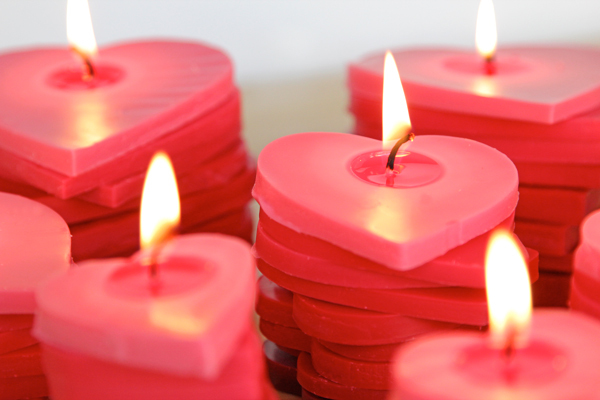 As the candles burn, the wax layers melt together, so it’s okay of they’re not lined up or your layers aren’t perfectly identical. How awesome is that? 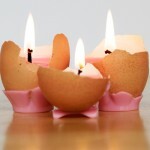 This is a great beginner candle project and a great way to use up leftover wax or recycle an old candle. 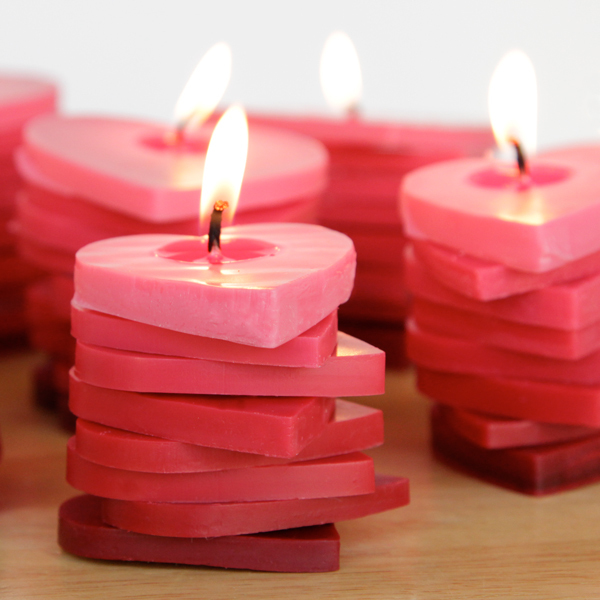 The ombre effect is lovely and a great way to add some Valentines-perfect red on pink to your place! These look so fantastic, especially having so many of them together! I want to make a whole slew of them so I can have stacks of them everywhere around my house! I love this so many ideas in my head different shapes and colors. Flowers for spring, eggs for easter etc. But don’t you need to mix in a hard wax so they don’t melt all over the place? I have looked into making pillar candles with a mold for soy wax, but I was told that straight up soy would make a mess and I had to do at least a 50/50 soy/paraffin mix to prevent a mess.